Hiya, frands! I’m writing to you from the Windy City, where the hubs and I spent the last few days celebrating our seventh wedding anniversary (WHAT I FEEL OLD) by doing what we do best — eating. Seriously, I did not realize just how much food I can actually put down in any given day. But if you’ve been following along on the Snapchat or Instagram, you know. YOU know. There’s been a lot of food that’s gone down into my belly. And it’s been great. That being said, after these crazy food frenzy trips I am always happy to get home and get back into my little routine, and to eat more normal meals and lighter fare. But dessert always has to happen. 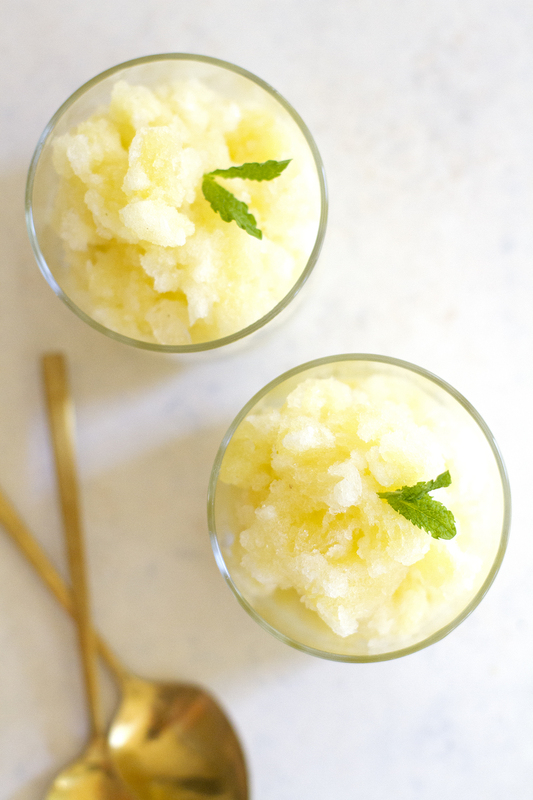 That’s where this lovely Pineapple Mint Granita with Rum comes into play. The granita is a truly underrated dessert. Some people think it’s shaved ice, while others say it’s like sorbet, but it’s really its own magical creation. It’s icy but soft, a texture that toes the line between a slushie and a sno cone. In this case, that slushie/sno cone is infused with fresh pineapple juice, minty sugar syrup and a splash o’ rum. NECESSARY. For this recipe, I like to puree and strain my own pineapple juice instead of buying it from the store because it is so much better, like by 104,257 lightyears. And pineapple is just so good right now — so good, that my family alone has gone through at least three of them in the last week — that it would be a crime to do this recipe any other way. 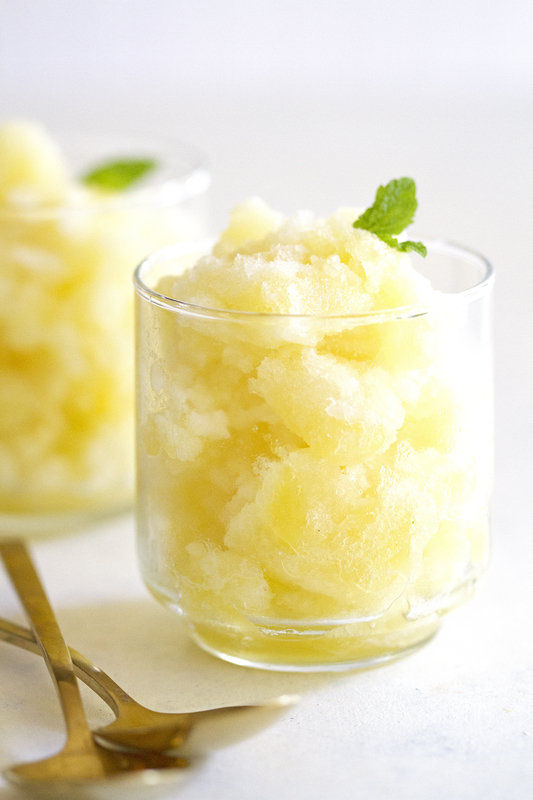 So take the extra threeve seconds to make your own pineapple juice for this granita, and prepare yourself for full-on pineapple-y bliss when it’s ready to eat. I love that the mint is just lightly infused into the sugar syrup, too, so it doesn’t offer flavor as much as it does refreshment. It’s just a hint of mint, and it’s tasty. The splash of rum also offers just a smidgen of flavor, too, just enough to make you go, “Ooh! That’s boozy!” but not enough to knock you off your beach chair by 6 p.m. 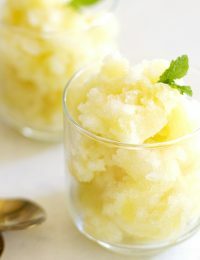 This granita is the kind of thing you want to serve after a heavy meal for an outdoor dinner party, or as a refreshing treat at a pool party (if you’re cool enough to have one of those, and if so, please invite me kthanks). Or, you can eat it as a light dessert when you’ve just come home from eating the entire city of Chicago. Ahem. 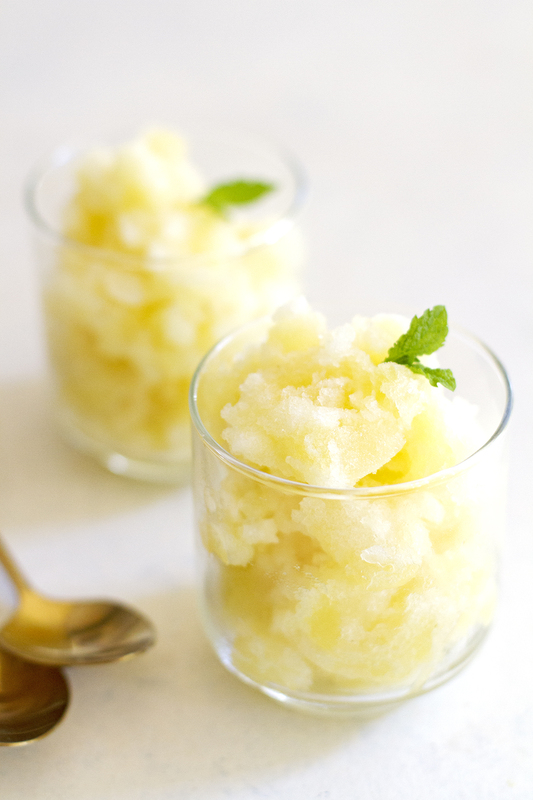 Summer dessert meets pineapple mint granita meets my face. To blender, add chopped pineapple. Cover and blend on high speed 1 minute until smooth. 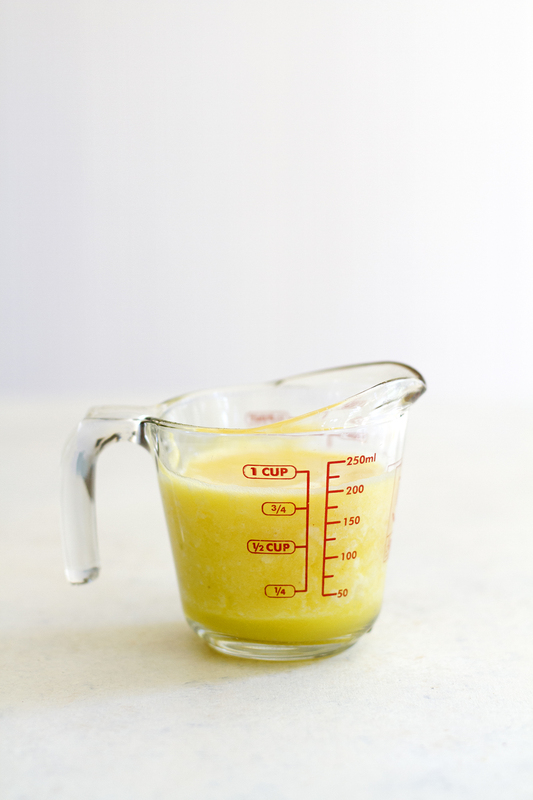 Strain pineapple puree into measuring cup. Measure out 3/4 cup pineapple juice and add to medium saucepan. Discard remaining juice and puree. Add chopped mint, sugar and water to pineapple juice in saucepan. 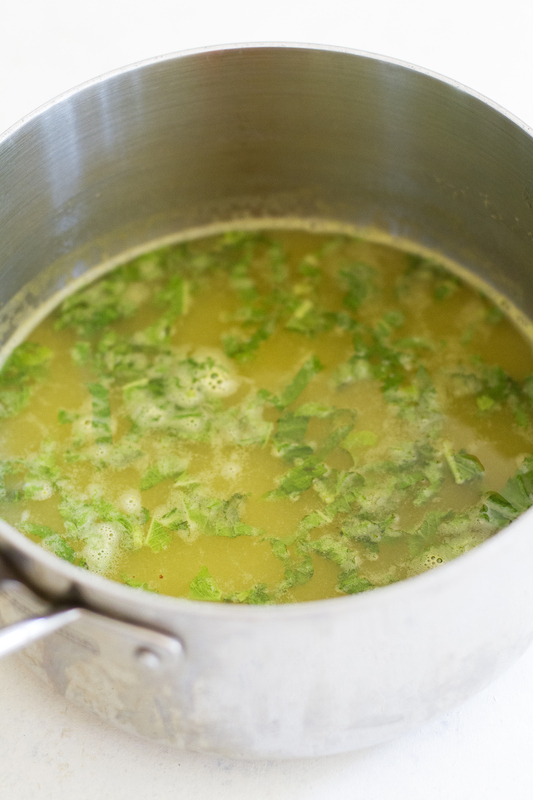 Bring to boil over medium-high heat; cook 1 minute, stirring to dissolve sugar. Remove from heat. Stir in rum. 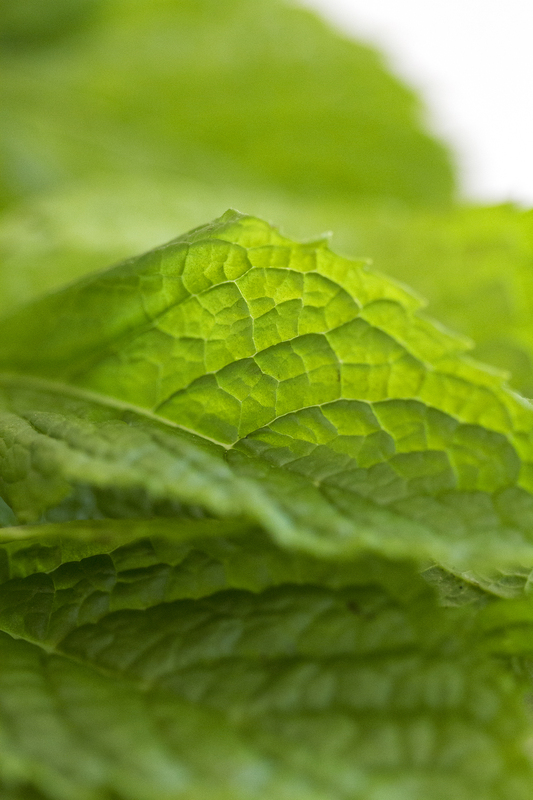 Strain mixture into 8-inch baking dish, removing any excess mint leaves. Cool completely. 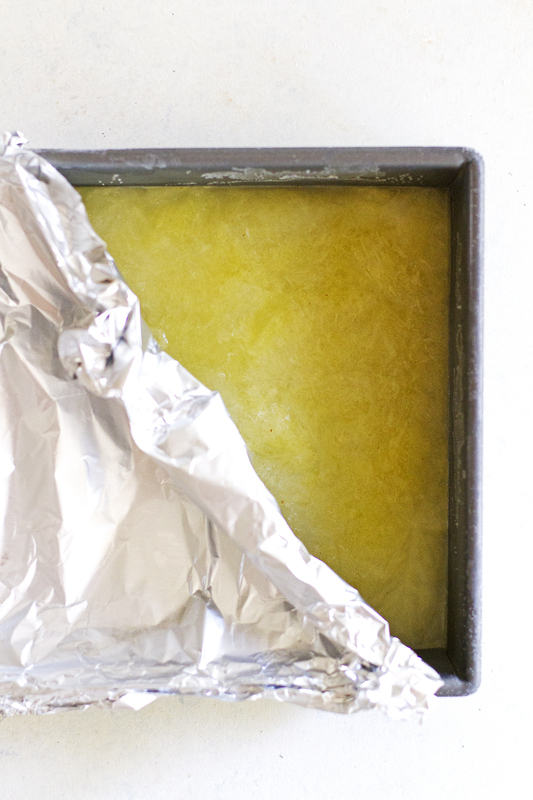 Cover and freeze at least 8 hours. When ready to serve, scrape mixture with fork until fluffy. Serve immediately. Happy anniversary to you and your hubs!! That’s awesome you had a chance to get out of town and spend quality feeding time in Chicago – I absolutely love that city! I wish I lived closer so I could carve out trips regularly. Enjoy your travels and cheers to a happy, healthy marriage. Oh, and this granita? Gaaaawgeous! I have yet to make a granita, and can definitely see this one being my intro to! I totally fell in love with Granita while in Sicily. Its so amazing. I’ll have to try these unique flavors! I have a serious love affair with granita — and this, so pretty, and man, it sounds delicious. This granita is everything! You had me at rum ;). Happy anniversary, dear! Happy anniversary to sweet couple. Sorry I am late to wish you. I am going to try a granita in Sicily! 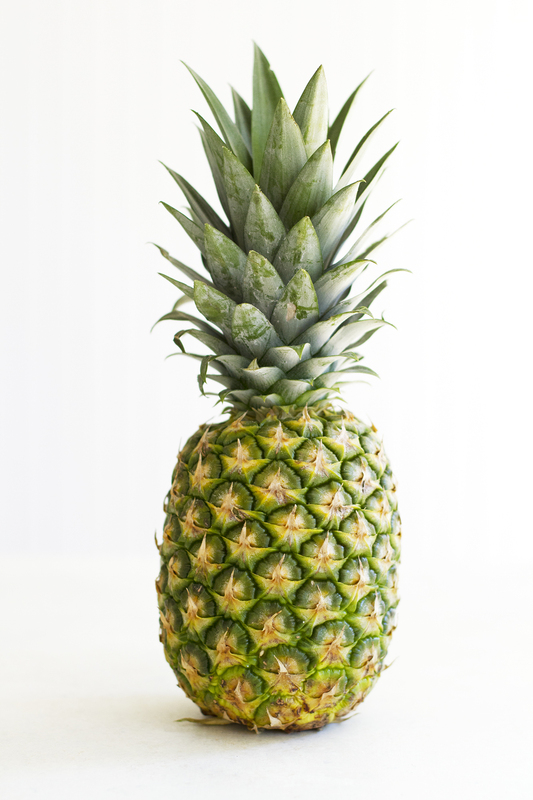 Thanks for sharing a video “3 Ways to Cut Pineapple” with us. Am I the first one to make the recipe and then post about it? Yay! -Make the simple sugar syrup first and let it cool. I feel that heating up the pineapple juice made it lose its tart and very bright kick. Same goes for the mint too. Heating up the juice and mint definitely is a quick way of preparing it, but I’d recommend muddling/crushing the mint leaves in the cold pineapple juice and letting it soak up the minty oils in a refrigerator for several hours. I’d also recommend a splash of lemon juice to make the pineapple flavor pop even more. I did add double the rum, because why not. It definitely didn’t take away from the deliciousness at all! I stored the mixture in a glass measuring cup with no problems. Austin — Thanks for your comment! Will have to try the lemon juice (and double rum ;)) next time!